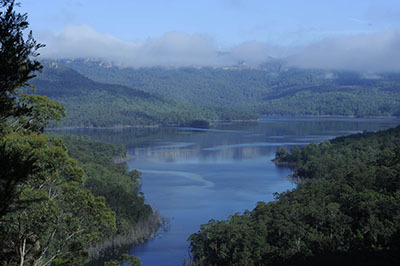 WaterNSW protects the Sydney's drinking water catchments to reduce the risk to water quality. WaterNSW protects the health of the Sydney catchment area to ensure reliable, quality drinking water is available for the 5 million people of Sydney and the Illawarra, Blue Mountains, Southern Highlands, Goulburn and Shoalhaven regions. The Sydney catchment area covers almost 16,000 square kilometres. More than one-third is important agricultural land for grazing, crops and horticulture, and just under one-third is national park and bushland. The area is home to 125,000 people living in 13 local government areas. Protecting catchment health requires a collaborative and long-term approach, because of the wide range of land uses, and the many individuals, businesses, industries, community groups and public authorities whose actions can affect water quality. By-products of catchment activities such as sewerage system discharges and run-off from agricultural land and urban developments can impact water quality. These and other risks can be addressed in a range of ways, from setting controls on land use planning and assessment tools for new developments, to reducing existing polluting activities by regulations, funding work, and engaging the community. WaterNSW is the NSW Government state owned organisation responsible for setting the strategic direction for protecting the Sydney catchment area. We determine priorities for action, based on the best science and technical information, best management practices, and the experience of landowners and other catchment stakeholders. We use a multi-barrier approach to protect water quality, as recommended in the Australian Drinking Water Guidelines 2011 (ADWG). This approach recognises that while individual barriers may not completely prevent or remove contamination, multiple barriers collectively provide a greater assurance that water will be safe to drink. Each year we publish a Catchment Protection Work Program that details the specific work and activities that will be delivered. At the end of the year, we report on our progress in our Annual Catchment Management Report. During the year WaterNSW works closely with stakeholders and the community to monitor progress with implementing catchment actions. We target WaterNSW funding to stakeholders in the right areas to achieve the best water quality outcomes.